Composting Basics gives an overview of the process. Sonoma County Waste Management Agency features home compost information. Through out the year, we have Home Composting Workshops. You can sign up for a Home Composting Workshop or check our Workshop Calendar for future workshops or presentations. Composting information available for the public, hands on activities for children, demonstration worm-boxes etc. 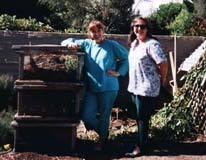 The Master Gardeners would like to acknowledge support for the home compost education program from the Sonoma County Waste Management Agency.